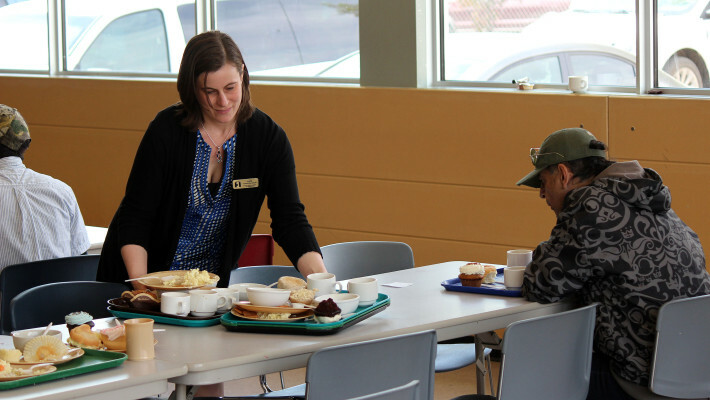 One thing that struck me early in my time as the volunteer coordinator, and continues to encourage me, is that the support for the Friendship Inn comes from all across the city of Saskatoon, into the surrounding area and even all around the province. These days I find myself driving around the city and everywhere I see business names on the side of a building who have come to volunteer, or sponsored a meal or sponsored a day at the Inn. I run into people regularly who know me from coming to volunteer. Even the nurse who taught my prenatal class had recently been to the Inn as a parent chaperone of her son’s class when they were volunteering. Now, because of spending time at the Inn, when I connect with new places and people around the city of Saskatoon, I think of the generosity of so many individuals and businesses. I love seeing this side of the city. It shows that so many people in our community know that to be a healthy community, together we need to make sure there is support for those in crisis, the most vulnerable in our community. After all, the Friendship Inn is a place of second chances. Much of the food we serve is donations of food that would have been thrown away – from day old bread & cupcakes, to leftovers from big parties, to fresh vegetables about to go bad that still have nutritional value if eaten today. The second chances extend to the staff, too. Many of our small kitchen and floor staff have been given a chance to work when other job opportunities may not have been offered. They have stepped up into the role of helping feed the guests of the Friendship Inn because they recognize the journey of many guests. They themselves have been on the other side of the serving line. Even the guests are offered the dignity of second (or third or fourth) chances. The no-questions-asked policy to receive a meal at the Inn comes with expectations of civil behaviour in the dining room. Yet even when someone is having a bad day and is asked to leave, the staff know that this is rarely the end of the story. Guests who have been asked to leave, often come back another day, apologize for their behaviour and are restored to the friendship offered at the Inn. Each day, more than just food is offered and received inside these four walls. I have been so grateful for this community of people, and even though I am going on maternity leave, I will pop by from time to time to chat with friends among the staff, volunteers and guests!